Today is the last day for digging. I want to get all of (18) removed and (14) beneath it exposed across the entire north-western half of the trench. On the slope of the hollow way, Chris, Mick and George are removing (17), while at the bottom of the slope, Greg is digging out a complete section from the bottom of it to see if it really does seal the road surface (12). Tony and Nigel are planning the chalk deposit on top of the road, which I suspect may be a late repair. Once planned, they will remove it. Tim and Lisa are doing some basic surveying. 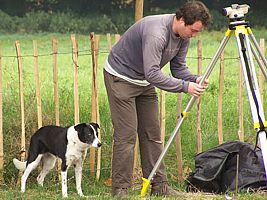 We’re having to use the dumpy level to tie the grid in to the Ordnance Survey. It will be very rough-and-ready, but it ought to be good enough until next year. I have a vague feeling that there may be an old theodolite at Burymead, which we would be able to use next year; if not, I’ll ask if we can borrow an EDM or theodolite from Heritage Network. Having located the grid, the next task is to do the traverse to Payne’s Farm to locate a benchmark that will enable us to tie our levels in to Ordnance Datum. I’m not sure where on Payne’s Farm farmhouse the benchmark is located, although I believe it is on a wall facing the road. I will need to get a value for it from an old OS map. It’s a real shame that we didn’t record the locations of the temporary bench marks we used during the earthwork survey of 1985, as they would have made life a whole lot easier for us today. As an aside, it’s become clear to me that we missed an awful lot of detail in that survey, as we were all terribly inexperienced. It would be good to come back to Church Field in the autumn to add in details, especially of house platforms and vegetational changes. A LIDAR survey would also be very useful and I wonder if the Heritage Foundation has carried one out for the whole of the Garden City estate. The weather is very warm already. It’s supposed to get into the mid twenties this afternoon, but it feels that already. It’s also very humid and I wouldn’t be surprised if we don’t get thunderstorms tomorrow (rain is predicted from the early afternoon onwards). 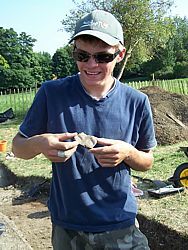 Odd fragments of Romano-British pottery have been turning up, mostly close to the site of the felled elm by the south-western trench extension. There was clearly Romano-British activity nearby and I wonder if some of the larger fragments of material have been brought up by the roots of the tree, It is a real contrast with last year, when I think that no Romano-British material at all was found. Deposit (17) has clearly been demonstrated to overlie the road metalling in the bottom of the hollow way. It also seems to be around 200 mm thick across the entire face of the slope and I wonder if it was deliberately laid as a means of consolidating an eroding side to the hollow way. It contains late medieval material, including both pottery and tile, with very little at the base of the slope (although there were a few finds, including a nail). We’ve had a couple of groups of visitors to the site, following the publication of a story on Thursday in The Comet. Among them was Brendan King, from the Baldock Local History Society, with his father. It’s a pity in some ways that we weren’t able to get the story in earlier, as I think we’ve had fewer visitors than we did last year (although the open evening was much better attended, by contrast). During the afternoon a couple from Knebworth came to visit. They had come just too late on Thursday to see very much, as it was getting dark (they had initially gone to the wrong church) and said they would be back today. They are going to write up a piece for the parish magazine. Yet more Romano-British pottery is turning up. Towards the north-western end of the site, we’ve now had a sherd of a colour-coated bowl (I think it’s Oxfordshire White Ware) and a piece from a Braughing jar. 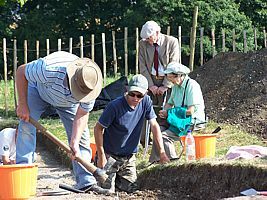 I wonder if the erosion of topsoil on last year’s site was responsible for the loss of early material rather than the absence of activity, as Evelyn Goodwin found Roman pottery on her allotment, the other side of 117/119 Norton Road. Tim and his team managed to locate the bench mark at Payne’s Farm before lunch. They are now doing the return run of the traverse. There was a difference of only 23 mm between the two, which is very good! During the afternoon, the weather became much hotter and sunnier. People were visibly flagging, so we had an early tea-break as I was worried about dehydration. There was the inevitable last minute find of a fragment of Romano-British box flue tile; if it’s related to the occupation in this general area, it suggests something of a rather higher status than I’ve been assuming, as it presupposes a building with a hypocaust. Nevertheless, one box flue tile fragment does not a villa make! We need more evidence, which we may get next year. Since little progress was being made and it was clear that we were not going to finish removing (18), we finished a little before 4 o’clock. The dig is now officially over and tomorrow will be spent backfilling. 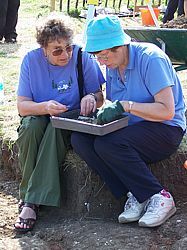 Posted on 31 August 2008, in Fieldwork, Norton Church Field Dig 2008. Bookmark the permalink. Leave a comment.